I am a professional photographer, specializing in baby and toddler photography. From my years of experience, I can say that when photographing babies,you need to have a lot of patience. This is entirely different from other genre of photography. Many couples expect their baby to be photographed when they are born, but most hospitals don’t allow photographers in the maternity department. 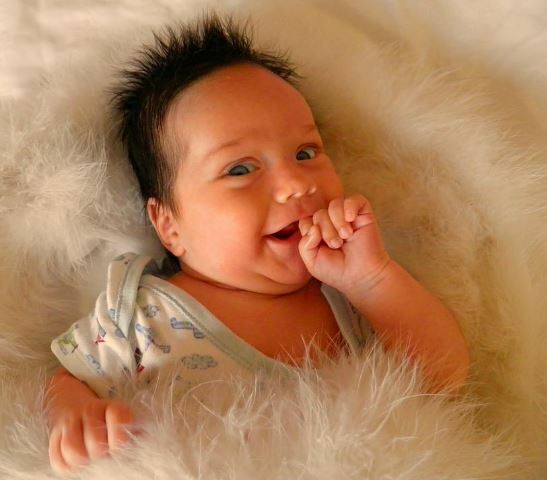 In this article, I will tell how to take divine snaps of babies. First of all, I just want to say that newborn babies should not be snapped using flash light of any kind of high intensity light. You should be very careful about that, otherwise the baby’s vision could be affected in the future. You can’t expect any pose from the baby. At the very beginning, most of the time they tend to be sleepy. They sleep in curly position. Baby photography is not pose oriented. This is a sort of candid photography. Photo sessions should be performed only when the baby crosses at least ten days. Personally, I do not take any assignment for babies less than ten days old. Many think that baby photoshoot is difficult. But I can say, if you have little bit of experience of baby photography, you can discover countless expression, because babies are incarnation of divine power. 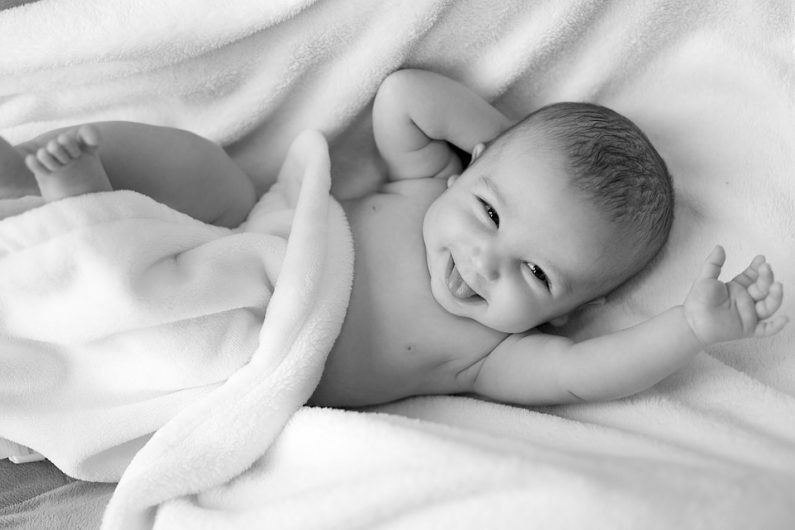 Parents will call you or they can meet you to consult about their baby’s photo session, as soon as the baby comes home from the maternity department of the hospital. You should tell them to wait for at least two weeks. If they agree with you, ask for the schedule of assignment. In case of outdoor photoshoot, I always prefer morning, because of soft sunlight. You should always avoid flash gun if the baby is under two weeks of age. For babies older than a month, you can use 90 degree bounce flash. Remember, safety is more important than anything for a baby. A pro DSLR with 50mm prime lens and a good quality external digital flash is required. Apart from these, two reflectors with an intelligent assistant is also required. As a specialized baby photographer, you may carry a sweet and small teddy or a sound making toy. Now, I like to share my experience and ideas with you. A baby will not give you any artificial pose.You have to find all natural poses and expression of him or her. Babies are safe in mother’s lap than any other place in the world. They cry very often, but when they feel their mother they shop crying.You should take this opportunity to snap him. The composition of the photo would look more beautiful if father accompanies the baby from behind the mother. The father can kiss the baby from the back. Generally, babies lack vision in the early stage. So if you are lucky enough, you can see the baby is looking. Do not use any kind of flash.Tell the parents to stand close to window, so that you can get enough natural light. Set the film speed to ISO 400 and set the aperture to f/2.8 and shutter speed to 1/80 and click. I hope you will get a nice photograph of that baby. If the day is cloudy, set the film speed to ISO800. 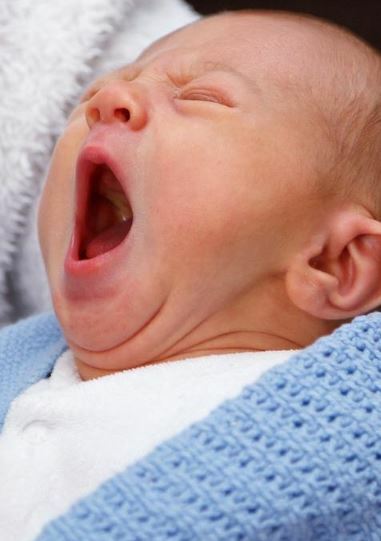 Yawning is a very common symptom in babies. This is not any symbol of tiredness. It is one of the funniest poses that baby makes. But to get this natural expression, you may have to wait for sometime. When the baby yawns, her toothless jaw gets exposed. You should take this photo using prime lens from and angle. In this special case, you can use a 90-degree bounce flash to avoid any direct exposure. As this is a close-up shot, the camera setting may be f/1.8 aperture, 1/500s shutter speed, and ISO200. No need to use flash if you get enough natural light. Baby’s lip is thin and has a divine expression. It’s a priceless beauty. This is very easy to shoot, even parents can shoot it at home if they have access to a DSLR camera. This body part is too small.For this, you have to use a macro lens. Macro lens require low aperture setting to get more light. Set your camera to f/1.8 aperture, 1/250s shutter speed, and ISO200. A bounce flash can be used. 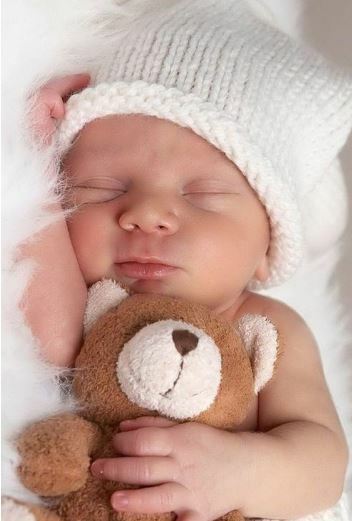 If there is a soft toy like teddy in your home, then place that beside your baby. To make it more funny, you can place it in between the baby’s small hand as if she is holding the teddy. You can try this pose at home easily. Snap it from at least one meter distance using prime lens. If you get natural light, then don’t use flash light. This photo should be taken in a garden. The mother will sit on the grass, holding her baby in the air. This is an excellent shot. Babies look beautiful in gardens. No need to give any artificial pose. For a sunny day, the camera setting should be f/5.6, shutter speed 1/125, and ISO100 or ISO200. 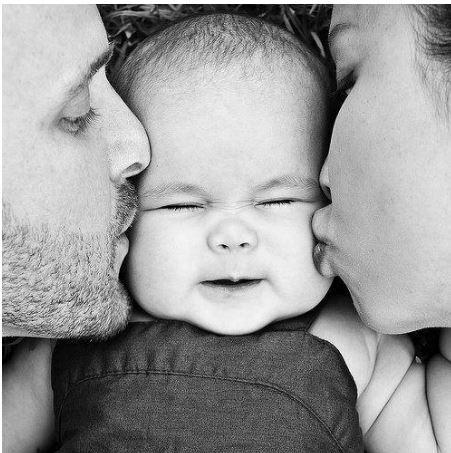 This is a nice example of homely baby photoshoot, with nice composition and parents kissing the baby from both sides. This is a close-up shoot. The frame will cover the full face of the baby in the center and has frontal part of parents from both sides. Again, prime lens is suitable for this shoot. Remember, this is a sleeping position shot. Focus on the baby from one meter up. Use f/2.8 and 1/250 and ISO 400.No flash required if you get enough light. 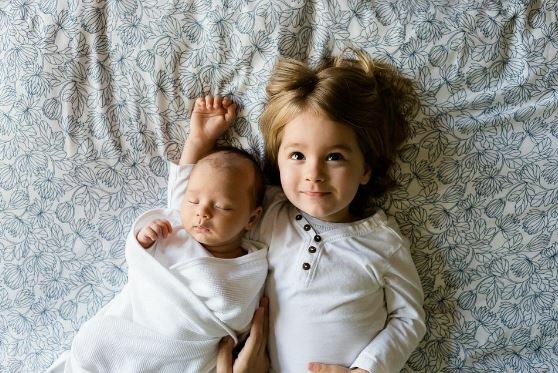 In this composition, the sister or brother of the baby will sleep on the bed holding her from right side, with both their faces facing upward. Again flash is prohibited. Take this shot near the window to get enough light. Use ISO 800 and wide open aperture. Even a parent can shoot this kind of shot by their own. In this composition, only palms will be exposed. 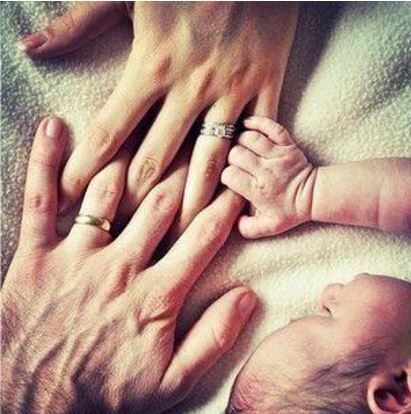 There will be three palms, parents’ palm and thebaby’s palm. This is a nice contrasting image. The baby’s palm will look much smaller and tender than experienced. This is a close-up shot. So use prime lens and focus from two feet away on the fingers of the baby, because in this case our prime subject is the baby’s hand. 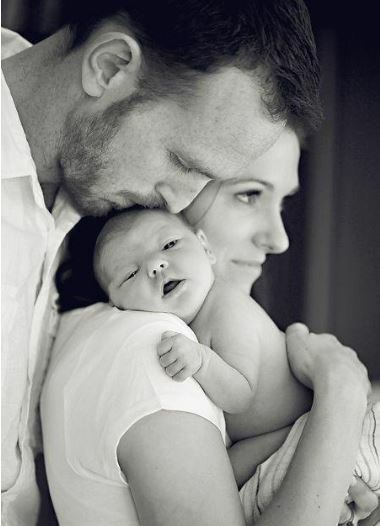 This is one of the best photoshoot ideas for baby that you can try at you home. 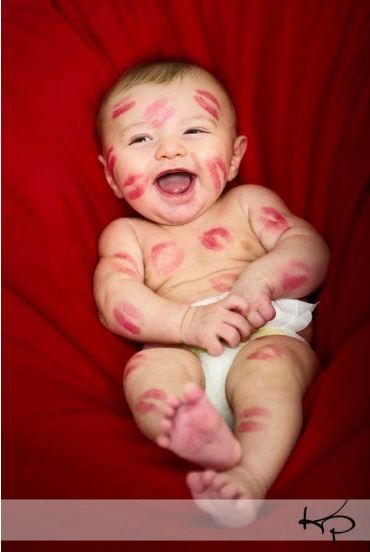 Color you lips with herbal color lipstick and then keep kissing your baby until the full body is covered with the kissing symbols, and then lay your baby on the bed and take shots from above. No flash should be used. Use wide open aperture and high film speed to get proper exposure. This is a unique and fun idea.I use it very often when I get baby shooting assignment. You also can try this at home. 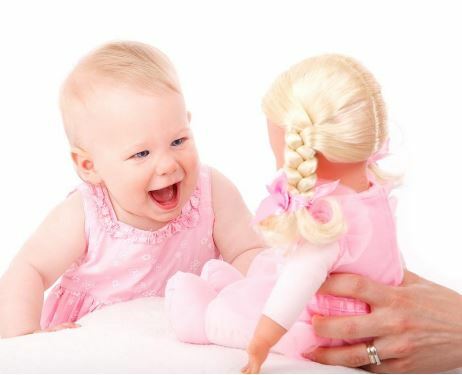 Let your baby scroll and then hold a baby doll in front of your baby. I am sure she will burst with joy and give some special expression. She will stare at it. In this case, take this photo from six feet away using a 50mm lens or you can use an 18-55mm or 18-105mm lens. Use bounce flash. Aperture should be f/8 and shutter speed should be 1/250. Use ISO 400. Use little bit high shutter speed to fix baby’s movement. 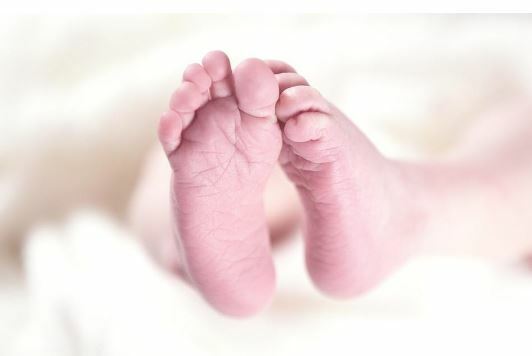 You can take some excellent shots of your baby’s feet at home, with minimum technical knowledge. This is a candid photography, where only feet and fingers will be exposed. Everything behind the subject will be blurred. You can use a macro lens or simply use a prime lens from an extremely close distance. Use f/1.8 aperture and 1/500s shutter speed. In this position, you can use bounce flash. Some babies smile when they are sleeping. However, this is a rare shot. You may or may not have opportunity to witness this holistic expression. But parents can witness this often. For me, this is the most beautiful expression a baby makes in its subconscious mind. This is not very easy to capture because nobody can predict this divine moment. But you should always get ready to have a snap of this rare moment by setting your camera to f/2.8 and 1/250s and ISO200. No need to use flash light. If you find poor natural lighting condition, just set you film speed to ISO800. I hope that will work fine. Do not use direct flash light. Always trim your nail properly before handling a baby. Wash your hands with soap before handling them. Do not use any infrared to focus the baby. Use manual focus ring.